Blue Nights is a funny little book. The hardback is beautiful, with a blue background and lettering, a black and white photograph of a young Quintana covering the back. Beautiful, but funny. It is several things; but should not be viewed as a sequel to The Year of Magical Thinking. The earlier book was the literary actualisation of Didion’s reaction to the premature death of her husband John, and Blue Nights is her reaction to the death of her daughter, Quintana. John died in 2003, Quintana in 2005. Quintana had been ill for some time, and was unconscious in hospital at the time of her father’s death. With Didion’s mother having died in 2002, the first five years of the 21st century were made up hospital visits for Didion, with hours spent contemplating death, illness and aging. Throughout both books she mentions her own ailing health and visits to the doctor. The two books of course share themes, but I do not see Blue Nights as a sequel to the earlier memoir. It does not matter which book you read first. One cannot learn of the death of John or Quintana without learning about the death of the other. Both events are now firmly ingrained in both Didion’s psyche and public image. 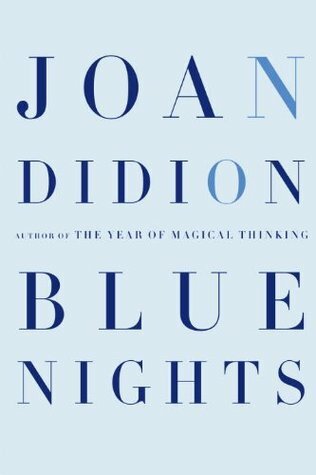 Blue Nights is about Didion’s relationship with her daughter more than anything else, and her own feelings about motherhood. She and Dunne adopted Quintana at birth in 1966. The adoption process was different back then, Didion states, and very soon after signing papers she and John took Quintana home. Like all new parents they experienced the overwhelmed and emotional feelings when left alone to look after a fragile baby. Didion and Dunne were unable to have children naturally and Didion states with ease that she never thought there was any guarantee she would have children; but, like many women, she still experienced a deep desire to have children – once her career had taken off, of course. She often felt that she did not meet ‘the standards’ of motherhood, though she does not say whose standards she wished to live up to or felt that she failed. Didion does not paint either herself or her daughter as ‘easy’ people. She was often working, and when she wasn’t she could be withdrawn and quiet, awkward and sad. Quintana was a precocious child with a vivid imagination and endless questions about the world and why things were the way they were. She had a strange recurring dream about ‘The Broken Man’ who would come and displace the parts of their family life. She suffered from a handful of mild mental health problems and often mused on macabre subjects. Didion repeatedly recalls her daughter wishing she could ‘just be in the ground and go to sleep’. She was certainly troubled. Of course there were factors beyond Didion’s control – mental health, the abandonment fears and worries that Didion states all adopted children feel – but the book is filled with the image of a mother worrying what she did wrong and unable to stop blaming herself for every minor problem. She often asks if she could have done things differently, made different choices or decisions. There is no conclusion or solution to these worries; no one could convince Didion that she did nothing wrong, regardless of the truth. Didion’s musings on her motherhood are explored through various memories of Quintana’s life, particularly her wedding in 2003 and their time living in California in the 1970s. For the rest of the book Didion recalls her own psychological reactions to Quintana’s death and her health problems. Here the tone is very similar to The Year of Magical Thinking, with Didion repeating memories and phrases, and pondering the depths that illness can affect both the ill and the family of the ill person. Certainly the themes are similar, almost the same, as the previous memoir, in which she pondered marriage and being a good wife. Now she ponders motherhood and being a good parent. Her husband John is not mentioned often. Quintana appears as a spectre haunting Didion’s dreams and worries, asking questions that she dare not, or does not want to answer. This is of course a very sad book. It is beautifully written in the usual Didion style – frank and careful, covering all the details and asking endless questions. I cannot say that if you ‘liked’ The Year of Magical Thinking you will ‘like’ Blue Nights; it is not as simple as that. These memoirs are not enjoyable in that sense that they are fun and entertaining, but they are well written and interesting, challenging and moving. Fans of Didion will want to read Blue Nights for the writing and the insight into her life and psyche; newcomers will enjoy the writing too, but also the discussion and musings on death, ageing, illness and family. Blue Nights is recommended, with warnings of tragedy. Published by Fourth Estate in 2011.